I say "used by" Mussolini because it wasn't original to him, but rather is an old Roman proverb. However, he used it in 1928 as one of many slogans for his Italian Fascist movement. While I don't agree with everything Mussolini ever said or did, the man blazed a trail that was followed unashamedly by many other 1920s Progressives. Was there a similarity between FDR's economic measures - especially the National Industrial Recovery Act (NIRA) of 1933 - and Italian Fascist economic policy? Mussolini, for one, thought so. The Progressive school of American historians also thought so at the time. Even FDR himself thought so, according to his letters. Case closed. shout-out in a 1934 London production of the Cole Porter musical Anything Goes. More recently and more interestingly, President Bill Clinton championed "the Third Way" of social democratic politics, a neither-free-market-Capitalism-nor-state-Socialism fusion that originated - by that name - with Mussolini. Let me Google that for you. So did Clinton's buddy Tony Blair and many other figures and institutions on the political left. In March 1919, Benito Mussolini reformed a Milan fascio (nationalist group) consisting of 200 men, into the Fasci Italiani di Combattimento (Italian Combat Squad). Mussolini created what we called fascism today, during this time. Fascism supported national unity, regardless of class, in the hopes that Italy would go up to the levels of its Roman past. He appeased the upper class, by promising to protect their existence, and the working class by advocating for the creation of a minimun wage and drastic improvements in transportation (like railroads) and infrastructure. Mussolini’s political ideology stimulated both the revolutionaries and traditionalists, and created what he called the ‘Third Way’. This way was neither socialism/communism, nor laissez-faire capitalism, but a combination of ideas from both of the extremes. So Trump retweeted a slogan Mussolini used in the 1920s? 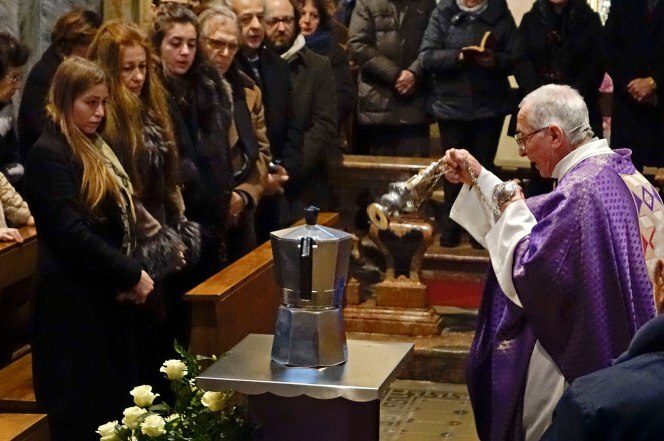 The joke there is that he didn't recognize the slogan or the "Il Duce" name of the sender. So what? I am much more concerned that so many contemporary leftist politicians consciously use the term and adopt the policy strategy that Mussolini created. 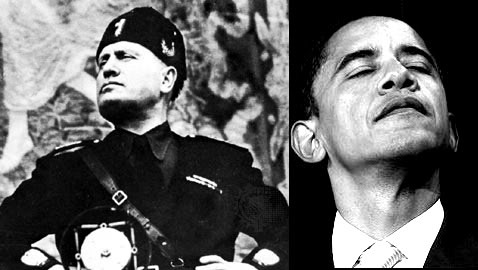 And what the hell is with that Mussolini chin pose that President Obama always strikes? That is just weird and annoying. ... then kill them all with drones tomorrow. Well, why not? The Obama White House desperately wants to close GITMO - it's "not who we are" and a terrorist recruitment tool, etc. - but, at the same time, it seems to have no angst whatsoever about using its Disposition Matrix, Obama's secret Kill List, the Facebook of Death. The Obama administration already hunts down and kills released detainees, like this one for instance, only not immediately and not en masse. 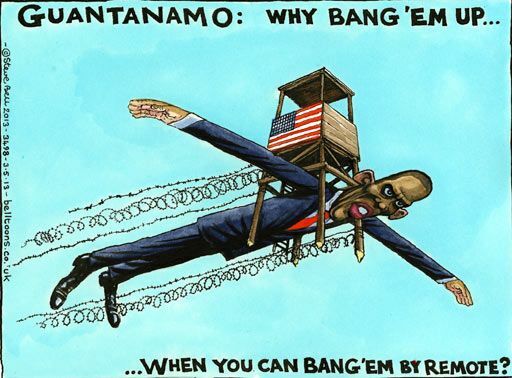 If it's serious about emptying out GITMO, why not give mass targeted killing a chance? It would satisfy most critics on the right, and would not necessarily upset all the critics of GITMO on the left. There are critics of drone warfare, to be sure. But many of the activists who oppose GITMO seem to be single-issue types who are so obsessed with the fact we hold detainees at all that they have no energy left for protesting the administration's practice of killing instead of capturing its enemies. Maybe a mass execution would come as a relief to them after the last seven years of frustration over Obama's many failed plans to close GITMO. As one of his first acts in January 2009, the president decreed that Guantánamo be closed within a year and set subordinates to work on the details. As Obama spoke of “responsibly” closing the facility, civil libertarians began to perceive a gap between what they meant by closing Guantánamo and what the White House meant. They wanted the president to announce that he would try the long-held detainees in federal courts, then hold those convicted and release those acquitted or unable to stand trial because torture tainted the evidence against them. They also wanted him to forswear trying those charged in military commissions that the supreme court had junked in a 2008 ruling. Every such group, from the ACLU to Amnesty International to Human Rights Watch, understood the phrase “closing Guantánamo” to mean putting an end to those practices, which they contended had undermined longstanding US commitments to the rule of law and human rights. The human rights groups so encouraged by Obama’s pledge to close Guantánamo smelled a bait-and-switch. Even if Obama got what he wanted, he wouldn’t be closing the facility in any substantive fashion. The indefinite detentions without charge, the military commissions, everything, save torture, that made Guantanamo internationally infamous would live on, except this time closer to home. Cori Crider of the human rights group Reprieve, who has represented numerous Guantánamo detainees, considers the Uighur resettlement an early, unforced and underappreciated capitulation that sowed the seeds for further failure. “Just think for a minute if those snapshots had been in America – if from spring ’09, everybody’s mental picture of ex-detainees was five dudes in T-shirts and hipster beards at a backyard barbecue. Everything later would have gone down differently,” Crider said. "Everything later would have gone down differently." What?? What color is the sky in Cori Crider's world? In what alternative universe would American voters have a mental picture of dudes with hipster beards when they see Islamic violent extremists, even ones like the Uighurs who only kill Chinese victims? To share her fantasy, you would have to ignore a massive load of reality. There are practical obstacles to releasing detainees, such as Pentagon foot-dragging that has effectively sabotaged the release mechanism, something that will likely increase as time runs out on Obama's last term. But, more importantly, there is an overwhelming bipartisan political consensus against closing GITMO or bringing detainees to the U.S. You could start with the recent vote on the current defense spending bill, which contained provisions to prevent the transfer of detainees to the U.S. That bill passed the Senate by a vote of 91 to 3, and passed the House 370 to 58. When Obama vetoed the bill, Congress overrode his veto and kept the provisions against transfer. There is no other issue on which so many of our elected representatives agree, and they agree emphatically. GITMO's detainees can't come here, so there will be no backyard barbecue photo-ops. Sorry Ms. Crider, but if you want a cute pet that will signal your virtue you should look into getting a rescue dog. So if transfer to the U.S. isn't politically possible, and if we've run out of foreign partners willing to accept more detainees, what can Obama do to make good on his Number 1 political promise of closing GITMO? Back to my thought experiment: since targeted killing using drones is a very feasible option for ex-detainees, as well as for the would-be detainees that we aren't trying to capture anymore, why not release and kill them? For whatever reason, Official Washington does not have the same objection to extrajudicial killing that it does to detention, not even the objection that it is a cause of terrorist recruitment and radicalization. That is very puzzling to me, because drone warfare clearly is a tool for recruitment and radicalization. There is a broad consensus for that proposition, coming from drone operators themselves as well as from the ranks of senior U.S. military leaders and intelligence and counterterrorism officials and foreign policy experts. Yet, the administration drones on and on, seemingly with no qualms about counterproductive backlash or even the very iffy evidence that leadership decapitation is an effective strategy in the first place. Why no qualms? I don't know, but maybe it's because the physical and mechanical distance between us and the victims makes drone warfare a political winner even when the victims are unintended (and there may be many unintended victims), while up-close-and-personal measures against detainees in our custody make us queasy. It's crunch time on Obama's promise to close GITMO, and here's my contribution to the all-nighters his dwindling band of loyal staffers are no doubt having. Go to Pakistan, ask them to accept our ninety or so remaining detainees - the worst of whom, Khalid Shaikh Mohammed, the planner of the 9/11 attack, is their citizen anyway - and relocate them to North Waziristan where we can pick them off at our leisure. Police say they figured out who he is after photos of his tattoos were provided by police in Florida, where he’s wanted on firearms and drug charges. The State Department made another Friday night document dump of Hillary Clinton emails, this time to the Benghazi Select Committee. You may browse them in the virtual FOIA reading room. Our friends in Venezuela have not done at all well under the socialist regime of Hugo Chavez and his successor. From being a wealthy oil state with little poverty 17 years ago, Venezuela's economy has gone steadily downhill until today, according to the World Bank, it has negative economic growth, massive public debt, 32 percent of the population in poverty, and 62 percent inflation, the highest rate in South America. It was into that economic death spiral even before the recent drop in oil prices. 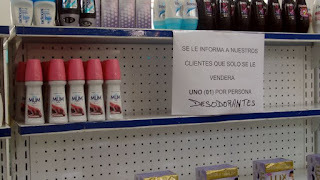 Venezuela, a country that takes great pride in its looks, is dealing with an issue that has the country in a major tizzy – shortages in beauty products. That means women and men so accustomed to looking their best are now having to do without shampoo, cosmetics and, hold your breath, even deodorant. 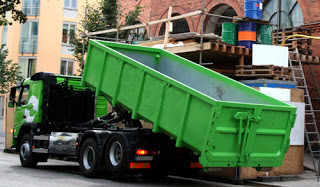 You can't just continue growth for the sake of growth in a world in which we are struggling with climate change and all kinds of environmental problems. All right? You don't necessarily need a choice of 23 underarm spray deodorants or of 18 different pairs of sneakers when children are hungry in this country. I don't think the media appreciates the kind of stress that ordinary Americans are working on. BTW, how many flavors does Ben & Jerry's need to sell? We don't necessarily need 23 of those, either. Would Vermonters be better off if they had only vanilla? I'm just wondering. Bernie's whole more-consumer-goods-equals-more-hungry-children idea didn't make sense in the first place, given all the actual economic experience to the contrary. 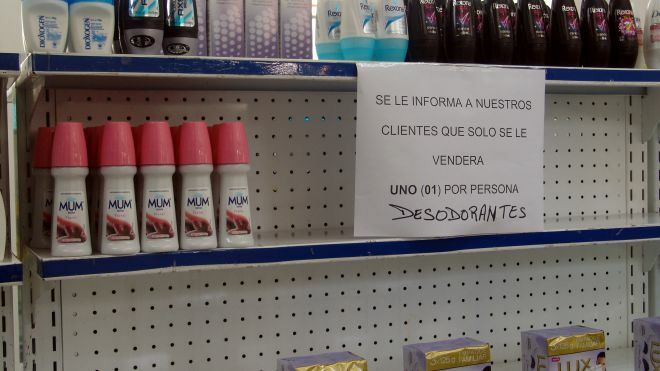 But now we have the example of Venezuela, the foremost socialist experiment in the Americas, where poverty is growing right along with a loss of choice - or even availability - of deodorant. "Growth for the sake of growth" would sound, and smell, pretty good to Venezuelans, I think. Doesn't anyone name their baby girls "Hillary" anymore? The evidence is inconclusive for several reasons, such as that popular names for children run in generational cycles, however, it does appear that First Lady Hillary Clinton put off many parents from naming their girls Hillary. Look at the steep drop off that coincides with the start of the Bill Clinton administration. It also looks like there was a bad Hillary aftertaste that has remained to the present day. The generational cycles in children's names are quite pronounced, by the way. A college professor friend tells me she is always amused by the historical echoes she sees in the names of new Freshmen. Twenty years after the Woodstock generation, classes were full of students with names like Sunshine and Freedom. Then, there were waves of Yuppies' kids with corporate-friendly names. And there are always names of twenty year-gone movie stars, and so on. I don't think all that many parents are inspired enough by politicians to name their kids after them. 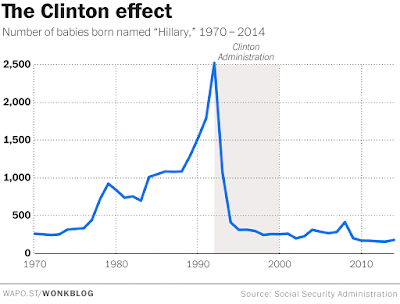 But, looking at that chart, I can believe that HRC spoiled the name for many parents who would otherwise have gone with Hillary. Truly, HRC has a likability problem, which is something that came up the last time she ran in a New Hampshire primary. Thank you WaPo Wonkblog for today's story on how the Clintons ruined the name ‘Hillary’ for new parents. There's not much to see here, but since an Italian activist of the No-War Network Roma went to the trouble of staging a scene and getting arrested, and an Iranian news agency recorded it an put in on YouTube for us to see, why not do so? Anyway, I hadn't seen anything about the incident in our local news media, so, kudos to the Islamic Republic of Iran Broadcasting people. SecState Kerry was in Rome this week to meet with Italian Foreign Minister Paolo Gentiloni regarding the coalition against ISIS. At a press conference on February 2, one of the attendees - Marinella Correggia, of the No-War Network - started toward Kerry while shouting and waving a poster. Local police collared her at once. Kerry's protective detail kept a low profile. I think I heard an American voice saying "whoa, whoa, whoa!" when the pinko started waving her poster, but it was the Italians who pounced on her. The National Counterterrorism Center puts out a weekly newsletter aimed at domestic law enforcement agencies and anyone else with an interest in non-classified news articles about terrorism. It's a modest enough thing, or at least it was until this week when someone in the Seattle area 'replied all' to the distribution list. She was answered by another 'reply all' from Nebraska, which was followed by some out-of-office messages, again 'to all.' Then she replied to all again to withdraw the first message, and so on, and so forth, until today the cyber floodgates were opened and hundreds of auto messages started going out to thousands of people on the newsletter's distribution list. 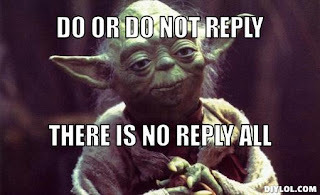 By noon today I'd received over 500 messages from people asking the NCTC to remove them from the newsletter distribution list, or from people replying 'to all' to tell other people to stop replying to all, or from NCTC advising me of non-deliverable messages. Finally, I set up an email rule to send any more messages to my deleted folder. I just hope this is really a fiendishly clever ISIS denial of services attack on the NCTC. That would be less alarming than the obvious explanation, i.e., that thousands of people in Homeland Security intelligence fusion centers from sea to shining sea are dumb enough to keep replying to all when they try to get out of this email storm.